Planning for your wedding? Call off the search and skip the guesswork, because our men’s benchmark satin finish groove titanium wedding ring is serving up some sophistication like you have never seen before. This show-stopping statement piece features two highly polished parallel grooves that subtly intersect a satin finish band in a stunning symphony of symmetry. Titanium is one of the most popular alternative metals on the market, and most modern couples love having a budget-friendly alternative compared to precious metals. Best of all, titanium offers the same resplendent hue of platinum as just a fraction of the cost. Each 6mm benchmark satin finish groove titanium wedding ring will keep its shine for a lifetime and resist corrosion, scratches, or discoloring. Every modern groom deserves a modern ring. 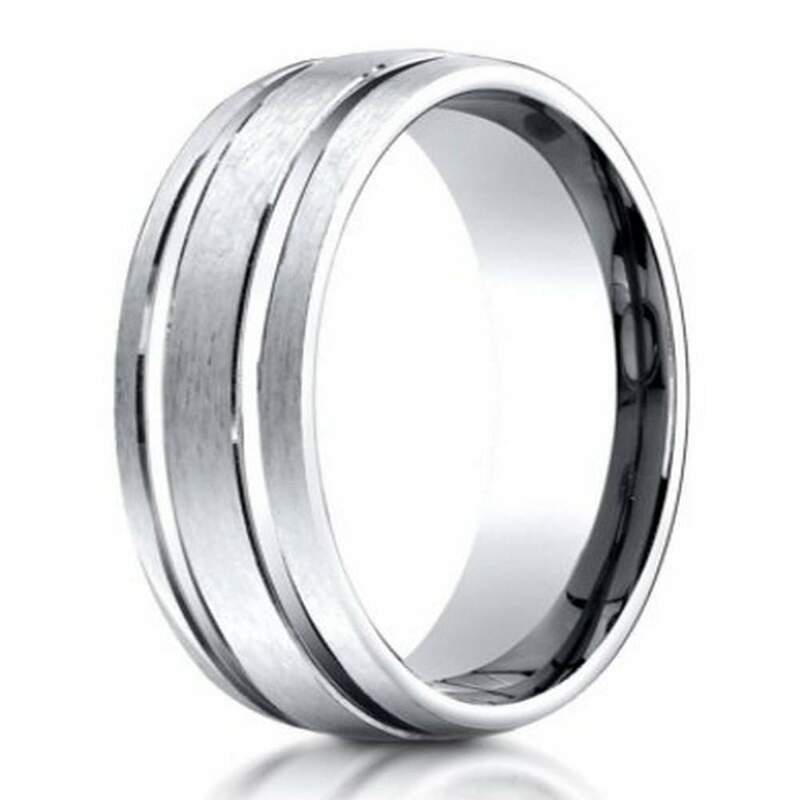 Celebrate your vows with our men’s benchmark satin finish groove titanium wedding ring on your finger. Each ring is crafted with a comfort fit design that makes it easier to squeeze over large knuckles. Comfort fit rings tend to measure a half size smaller than traditional rings, so we recommend that you have your finger sized by a professional jeweler. We offer one of the widest varieties of ring sizes on the market, ranging from size six to 14. Find our 6mm men’s benchmark satin finish groove titanium wedding ring in your perfect size today. Before finalizing your order, add a special engraving to keep the spark alive for years to come. If you have any questions about this product or our inventory, please contact JustMensRings.com today for additional information. After looking all over the internet, Just Mens Rings was one of the few places where I could get a size 14 ring fast. Customer Service called the day after my order to explain that they would ship directly from the manufacturer if it was a rush (it was), and couldn't have been more helpful. The ring is slightly darker than pictured, but is still very nice looking. The fit is perfect and my husband loves it. Very comfortable. We are very pleased with our purchase. We comparison shopped and found the prices at justmensrings were better than anywhere else. I was surprised that a rep emailed me to let me know that because we are in Canada, the shipping may take longer than anticipated and held my order until I confirmed that we still wanted it.The ring actually arrived faster than it was supposed to! The ring was exactly as it looked on line, my H2B says it's very comfortable.